Evening. Convenient for railway station. A few left in winding down the day. On the way back from the Rum Puncheon had 15 minutes to kill so we had a swift one. Just a few others in. Sells a mix of boring nationals and more unusual beers. 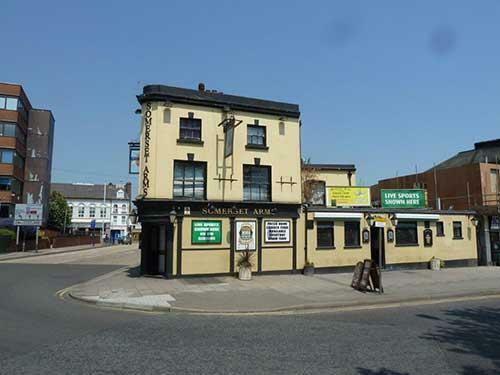 The pub is found in Gravesend, Kent, DA11 0RU. Street corner pub in Darnley Road, near the railway station. Brewers' Tudor interior, one large room with lots of areas with varied seating types. Rock and sports (especially boxing) memorabilia on the walls. An unusual bank of misericord seating presumably from a church. Nice brass Fremlin's sign. Boarded ceiling. Varnished wooden parquet tiled floor. Re-opened in December 2018 initially, at least, selling no real ale.